With recent temperatures dipping below freezing in the Bay Area, the subtropics seem a world away. Fortunately, we are near enough to that climatic region (from around 23.5 to 35 degrees of latitude) to enjoy its abundant winter harvest. At the farmers’ market, subtropical fruits like citrus, cherimoya, and guava provide some of the brightest colors and flavors of the season. One of the most beloved subtropical fruits is different from the rest; it is a big green berry that contains no sugar and has more oil and protein than almost any other fruit. In a culinary context, it is used more often in savory dishes than in sweet, but is also sometimes used in desserts such as ice cream. Can you guess what large-seeded fruit we are referring to? 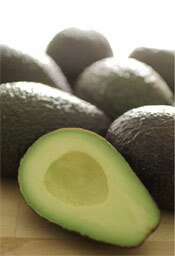 Avocados are thought to have originated in Mexico, though their exact genesis is unknown. Like corn, figs, sugar cane and other ancient crops, the avocado is a cultigen: a species domesticated so long ago (around 7,000 years in the case of avocados) and that has undergone such dramatic changes that its wild ancestor cannot be determined. Whatever the original source, most agree that cultivated avocados originate from three different regions: Mexico, Guatemala, and West India. In the 1950s, Harold’s nephew Hank and his wife Ellen decided, for fun, to start their own small nursery. The subtropical nursery stock they grew was in high demand, and Brokaw Nursery soon expanded to be the largest distributor of subtropical stock in California. Will Brokaw, Hank and Ellen’s son, manages farmers’ market sales of fresh fruit for Brokaw Nursery. He says his parents foresaw the “avocadoization” of California, a phenomenon that began in the 1970s. At the farmers’ market, shoppers will find a diversity of avocados. Bacon, Fuerte, Pinkerton, Zutano, Gwen, Reed, Nabal, Esther, Lamb Hass, Jim, Mexicola, Stewart and, of course, Hass varieties are available most of the year, though each variety has its own season. The varieties vary more in characteristics like seed size, peel-ability and oil content than they do in flavor. Two Ferry Plaza Farmers Market avocado farms, Four Sisters Farm and one of the Brokaw Nursery properties, are outside of the subtropical zone, so cross your fingers that tonight’s cold spell doesn’t result in a deep freeze. Temperatures much below freezing sustained for a long period can mean two years without fruit. For a guide to avocado varieties and other information about avocados, check out the California Avocado Commission website or the University of California’s Avocado Information Page.